When I wrote the first article on WordPress and Vagrant I introduced WordPress VVV. VVV is a Vagrant configuration for developing WordPress themes and contributing to the core. One common problem, however, is that many people were overwhelmed with VVV. Especially those new to Vagrant, who just wanted to get something simple up and running fast. There are many other Vagrant configurations, one of the easiest to use and most popular in WordPress circles is Chassis. 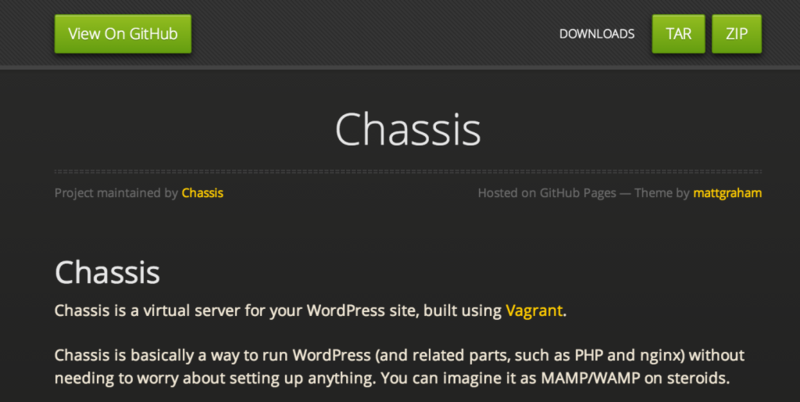 Chassis is a simple Vagrant configuration, popular among WordPress plugin and theme developers. It’s easy to get started with and use on a per project development. In this article I’ll walk you through setting up Chassis. The folder structure is a bit different, so we’ll get into that too. The Chassis configuration has a hierarchy, so understanding how that works is also important. The last topic we’ll cover is extending Chassis by adding plugins that include more features. There are several reasons why someone would choose to use Chassis for WordPress development. Firstly, Chassis is lightweight. In contrast, VVV is rather heavy as it comes with a wide range of tools. The problem with VVV is that it can take a long time to install, and it’s slow. In comparison, Chassis takes just a couple of minutes to install. Where is phpMyAdmin? Everything else that you may want to install, such as phpMyAdmin for example, comes as an extension. Memcache is also available, Xdebug is comming soon. The command git submodule update --init makes sure you download every submodule. A nice feature of Chassis is the separation of the WordPress and development directories. By default the folder that contains the themes, plugins and uploads folder is the content folder. When you first clone the repository, there is no content folder. The WordPress folder is called wp but there is no content folder. You can start creating the folder yourself and build the structure. The team behind Chassis has a predefined content folder available on GitHub (called ‘Supercharger’). Supercharger comes with some plugins, such as WordPress SEO, WordPress Importer, Limit Login Attempts and the Regenerate Thumbnails plugin. Wait until the installation finishes. You now have a ready to use environment. Everything is pre-configured, there’s no need for the famous 5 minutes configuration. After the installation finishes, visit http://vagrant.local/ in your browser and see if it works. You should see a ready to use WordPress site, skipping the installation process. You may have noticed that after installation there are two new files. The local-config-db.php file and local-config-extensions.php. Don’t edit these files. They’re generated using the config.yaml configuration. If you want to edit these files, you’ll need to edit config.yaml and then provision using vagrant provision. Chassis separates the WordPress folder from the content folder. By default, Chassis disables the auto-update so you’ll have to install any updates manually. Separating the folders is a good decision. Using this separate content folder doesn’t mean that you can’t work with the wp-content folder, but it’s better to stick with the content folder. config.yaml has a hierarchy. config.local.yaml has the highest priority then config.yaml in the content folder. By default these configuration files don’t come with Supercharger. You can copy the existing file from the root folder of the project. config.yaml and config.local.yaml in the root folder of the project have the least priority. config.local.yaml always has the highest priority in the particular folder. When you start with a fresh folder you’ll only have one config.yaml in the root folder. This is the lowest priority. Inside that file you can configure the PHP version (5.4 by default), the WordPress directory (/wp by default), the database configuration and WordPress credentials. Let’s experiment a little. First open vagrant.local/phpinfo.php to see what PHP version you’re using. By default you start with 5.4. Copy the config.yaml to the content folder. Edit the PHP version and set it to 5.5. Execute vagrant provision and after the provision navigate again to vagrant.local/phpinfo.php. Copy the config.yaml from the content folder and rename the copy you just created to config.local.yaml. Again, edit the PHP version to 5.4 again. Execute vagrant provision and test it in your browser. Try the same thing with the admin configuration. On config.local.yaml edit the password to “thepassword”. Execute vagrant provision again and test it to login in with this password on the dashboard. The password is wrong. So why is that? You can’t change the password or the admin credentials via provision. However, if you vagrant destroy and vagrant up again, you will see that the password for the admin is now “thepassword”. Be careful with this configuration. Try to separate the local configuration from the deployment configuration. Chassis supports extensions, I’ll cover a few of the popular ones. As you can see from the name and icon, this is a tool that catches emails that are sent to it and displays those in a web interface. This tool is used for testing purposes, when you don’t want emails sent to a real email provider, but you also need to see if it works. Installing this tool using Chassis is easy so you don’t have to worry about configuring anything. Copy the Mailcatcher repository on Chassis to the extensions folder and then vagrant provision. Now go and add a comment to a post. Navigate to http://vagrant.local:1080/ and you will see that mailcatcher has ‘caught’ the email. I don’t think that this tool needs any introduction. This is one of the most popular tools when dealing with databases. Just like MailCatcher, this extension doesn’t need any configuration at your end. The installation is similar to MailCatcher. Now navigate to vagrant.local/phpmyadmin and you’ll see that no login is required. The Memcache extension installs Memcached properly, you can read the documentation for information on how to use this extension. Using Vagrant and Chassis is one of the easiest to use and fastest environments for WordPress development. It has a good workflow by separating the WordPress installation from the working folder. It’s also simple, yet powerful when it comes to extensions.